Thomas Jefferson was the 3rd President of the United States of America, the symbolic leader of the country. His presidency began in 1801 and ended in 1809. He was 57 years old when he first began his term of office on March 4, 1801. He was named after his paternal grandfather 'Thomas Jefferson II' who was a Justice of the Peace and sheriff of Henrico County, Virginia. He had a variety of nicknames including Apostle of the Constitution, Sage of Monticello, Father of the Declaration of Independence, Man of the People, The Pen of the Revolution, Long Tom and The Apostle of Democracy. Many of the nicknames referred to his role as an American Founding Father and as the principal author of the Declaration of Independence. The picture of Thomas Jefferson portrays an interesting image of what this famous man looked like. The picture shows the clothing and the hairstyle that was fashionable during his presidency. He is described as being 6 feet 2.5 inches, which gave rise to the nickname "Long Tom", and had a slim build, 174 pounds in weight. His unusual height resulted in a stooped, loping walk. He had small, hazel colored eyes and reddish-blond hair that turned gray as he aged and freckles. Thomas Jefferson showed no interest whatsoever in his appearance preferring comfort to fashion. His focus was on his work, not the way he looked - a "Man of the People". Character and Personality Traits: What was Thomas Jefferson like? The personality of Thomas Jefferson is described as easy going, open and direct. A great scholar who was diligent and meticulous in his work. A wise and highly intelligent man, some say a genius, and was called the "Sage of Monticello" and the "Father of the Declaration of Independence". Thomas Jefferson preferred his own company to others, a sensitive introvert who appeared reserved to people he did not know. The important role and duties of the President of the United States of America include those of Chief of State, Chief Diplomat, Chief Executive, Commander in Chief, Legislative Leader and Leader of his own political party. What was Thomas Jefferson famous for? Why was Thomas Jefferson important? 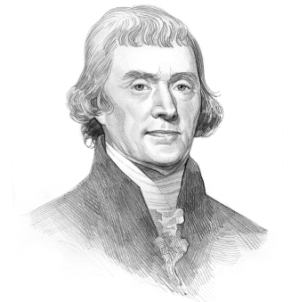 The history and life of President Thomas Jefferson during his presidency is conveyed in the following fact file in an easy question and answer format. What President was Thomas Jefferson? He was the 3rd President of the United States of America. The dates of his presidency began in 1801 and ended in 1809 (March 4, 1801 to March 3, 1809). What other political offices did Thomas Jefferson hold before his presidency? What was Thomas Jefferson' nickname? Who was Thomas Jefferson' s first lady? Thomas Jefferson was famous for the events and accomplishments of his presidency, but what are the facts about the man and his private life. Facts and information about the private life of Thomas Jefferson can be found in the following fact file in an easy question and answer format. When and where was Thomas Jefferson born? Where was Thomas Jefferson educated and what was his religion? What did Thomas Jefferson do before he became President of the United States? Who was Thomas Jefferson' wife and when did they marry? Did they have kids? When did Thomas Jefferson die? We hope that the picture, facts and information on President Thomas Jefferson will prove helpful to kids, school children and schools learning about the presidency of this famous American leader. The facts about Thomas Jefferson provides an overview of the President's character and personality traits. Watch the video and learn more about the major events of his life and his accomplishments. The following Thomas Jefferson video is a useful educational resource for kids, children and schools learning about the life of the US President Thomas Jefferson.